Listen and read along to Emily's Brush with History and find out why history is so important to us today. Emily yawned loudly and pointedly as her Great-grandma Dorrie launched into the story of her trip to Egypt and the pharaoh's tomb. She had told the same story over and over again ever since Emily could remember. It was her one great adventure as a girl, and it bored Emily to death. Great-grandma Dorrie fixed Emily with her sternest stare and sniffed. "Some people in the room do not seem to appreciate first hand accounts of history." Emily snorted sarcastically. "Who cares what a bunch of dumb old dead people did a trillion years ago. History is boring." Carey glared at her sister. "Ignore her, Great-Grandma," she advised. "Emily only says that because she is flunking her history class. Her teacher told Mom she has a listening problem." Great-grandma Dorrie raised her eyebrows. Emily smiled back at her, not caring what Great-grandma Dorrie thought. Then, Great-grandma Dorrie quietly chanted something strange. Emily wondered what the old prune was up to. But no one else seemed to have noticed. "Emily!" her mother called sharply. "You're not listening again. Stop daydreaming. It's time for bed." Emily jumped. Great-grandma Dorrie's boring story must have put her to sleep. Obediently she got up, and climbed the stairs. The next morning Emily woke to a great crash outside her room. Then a booming voice shouted, "Wake up, Dorthea! We must be on our way shortly, or we will miss our train." Emily leaped out of bed and froze. What had happened to her room? It looked so strange. It was filled with furniture that looked as if it should have been in an antique shop. And who was that man calling for Dorthea outside her bedroom door? Emily quickly put on the clothes laid out on the bed. They looked like something out of that mummy movie with Brendan Fraser. The dress was scratchy where the lace touched her neck. The shoes had weird buttons that she couldn't get to fasten right. Outside her bedroom door she found a man who looked like Great-uncle Silas in the pictures Great-grandma Dorrie had shown them. He stood glaring at a large broken vase. "What year is it?" she asked the strange man. "Who are you?" The man barked a loud laugh. "Come, Dorthea, we haven't time for silly games. It's the same year it was yesterday, 1922. And I am still your Uncle Silas, who has the pleasure of escorting you to the great pharaoh's tomb at the museum. Now come along, or we will miss our train. You've slept so late you missed breakfast." Emily could not believe what was happening to her. It had to be a dream, but it seemed so real. The inside of the house was filled with old black-and-white pictures in fancy frames on the wall of the stairway. The television in the living room was gone and a large bookcase stood in its place. The couch didn't look nearly as comfy and there was no recliner, only a chair with a high back and a hard looking seat cushion. Outside the house the streets and other houses appeared different too. The street was full of horse carts and funny looking cars, Uncle Silas climbed into an auto parked right out front. Emily climbed in next to him and looked for seat belts. But there were none. She watched as her uncle started the motor and pulled out into the street without even looking. Tires screeched behind them and someone shouted. But Uncle Silas ignored this. Emily clung to her seat as they went on a hair-raising ride. She wished she had paid more attention to Great-grandma Dorrie's stories of her childhood. How was she going to survive this crazy ordeal? What if she stayed in this time forever? She began to crave one of her history books. Soon they parked, or at least stopped the car somewhere. Uncle Silas walked toward a building that looked like the mall. Inside, she found it was a train station. Emily watched the people in old-time clothes as they hurried back and forth. It was scary to see everything so different. But it was also fascinating. "Don't dawdle, Dorthea, we must hurry!" Uncle Silas shouted. Emily followed his long fast strides at a run. She had never met anyone so impatient in all her life. Soon they were on the train and headed to the museum. Emily looked out the window at the downtown area. There were no skyscrapers anywhere, only some tall buildings of brick or stone. At the museum, uncle Silas paid their admission fee and bypassed all the other exhibits in favor of the great pyramids of ancient Egypt. Quickly they walked through darkly-lit hallways representing passages in an ancient Egyptian pyramid. Finally they stopped before a glass encasement of a mummy. Uncle Silas moaned as if in pain. "Look at what they have done," he said with a sigh. Obediently Emily looked at the mummy. It didn't look like much, but she didn't see anything wrong with it. "It won't last long under these conditions," Uncle Silas mumbled to himself. "It was bad enough when ancient artifacts were stolen from the tombs to be put in cheap exhibits like this. But the mummies are delicate and will fall completely apart under these conditions. These amateurs have no idea what it takes to preserve them. And future generations will have lost all the information and the chance of witnessing a part of the history of ancient civilization." Even with Emily's limited knowledge of history, she suspected Uncle Silas was right. There were still many unanswered questions about Egypt and the pyramids. Could this kind of carelessness be the reason? 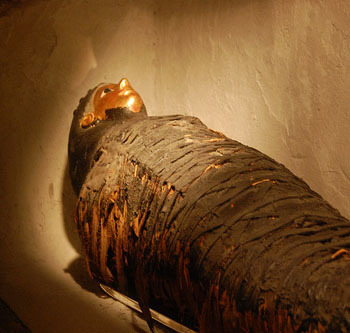 Being back in time herself, she could almost feel sorry for the mummy. It had once been a living person. Now it was on display to be gawked at. Then Emily felt someone shaking her and shouting in her ear. She opened her eyes and stared at her sister Carey. "Emily," Carey gasped. "I thought you were dead. I couldn't get you to wake up." A booming voice from behind Carey said. "Oh, don't be so melodramatic Carey. Emily was only sleeping soundly. Now run along child, and brush your teeth." Great-grandma Dorrie smiled down at her. Emily smiled back. When they were alone, Emily asked, "How did you do it?" Great-grandma Dorrie smiled secretly. "I don't know what you are talking about, Emily." But Emily persisted. "It wasn't just a dream. I was back in time, in 1922. You sent me there to teach me a lesson. History isn't just a bunch of boring old dates and facts. It is real. Knowing it helps us understand our own life and the times we live in." Great-grandma Dorrie ruffled Emily's hair. "Get dressed," she told her. "Or you will be late for school." "Okay," Emily said. "But next time you talk about Egypt, you have to teach me that ancient spell you used to transport me back in time." I would have given it 5 stars but the ending was just left and I would have given it a bit more. But it was a cliff hanger so it still worked. I liked it though it was a tiny bit boring at the beginning. it sound good but is not really exiting because there isn't introduce of the character in there. It's really cool. my sisters read and they said is good. It ended to fast Emily wasn't in 1911 for long. It was ok. That is all I have to say about it...It wasn't as interesting as the others though. This was a good story. I like that the person reading it makes different voices for different charecters. It was great to listen to and I wonder what it would be like to go back in time. this theme was about a girl name emily, and the passage said that emily woke up, and her room looked diffrent.She heard a man telling her to wake up. I wish Emily could have solved her own problem though.